I knew Jason Lavery back when he was brewing in his basement from a kit his wife, Nikki, bought him for Christmas. We met when we were both involved in L'Arche Erie, and from the way the guy would talk about beer, I had a sense -- or maybe more of a hope -- that he'd make it, both the beer and by becoming a succesful brewer. The short of it is: He is -- and so is the crew around him. In the Reader, we featured Jason way back in our third issue in the You Ought To Know column, wrote about when Lavery's Pub opened, interviewed him about Beer On The Bay, visited their developments when we were in search of the perfect pint in Erie, featured Jason in our inaugural 40 Under 40 class, celebrated when their pub began serving food, congratulated them when they won a gold medal at the Great American Beer Festival, and watched them duke it out in Erie's first-ever Bines Versus Vines. 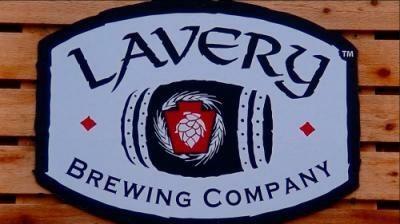 And the really short of it is: Lavery Brewing Company's made it because they churn out a damn good product that's now region-wide, and they work their tails off. So what better a way to talk about the craft beer scene in Erie and beyond, the inception of an award-winning brewery, and just how they come up with names for their beer, like Dulachan, than to invite Jason, Nikki, Jason Lynch, and Pat Miller on to the radio and drink some beer with them? You can listen to the episode of Weekend All Things Erie here. We were drinking a Dulachan while we chatted -- just in case that's what you want to drink whilst listening. And then Saturday, Sept. 6, you can head down to their Pub and help them ring in their one-year anniversary celebration. Ben Speggen loves craft beer and loves debating whether Dulachan or Death or Glory is the best beer Lavery makes. If you want to talk about print-based beer-based things, write him at bSpeggen@ErieReader.com. If you want to talk about radio-based beer-based things, write him at Ben@WQLN.org. You can follow him on Twitter @ERBenSpeggen.